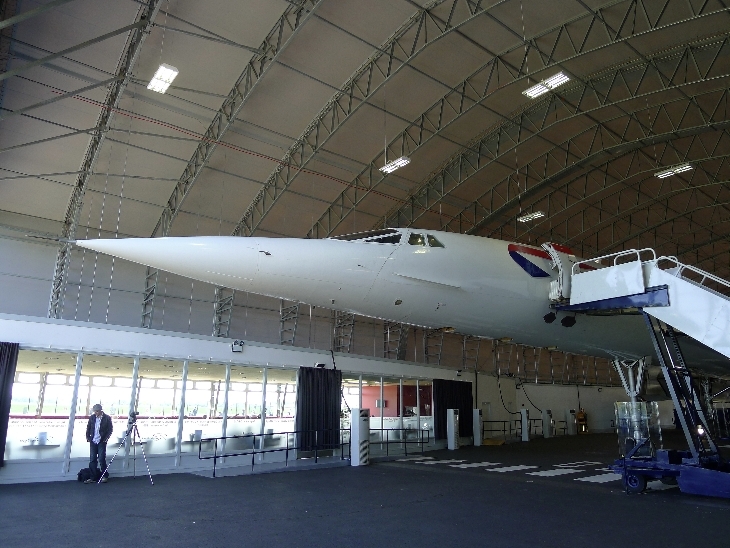 The only fully intact Concorde of the six in existence is on display here in Manchester, UK. Three month waiting list to get a ticked]o to tour it. Pristine condition. I was little surprised it’s bigger than I imagined it. And the inside is not unlike the average modern jetliner. The distinction ends there. Top speed nearly 1400 miles per hour, twice the speed of sound at 60,000 feet. London to New York in 4 hours. Back in the day, a round trip ticket would be over US$10 – $12,000 today. About half the weight of the plane was fuel, which it gobbled in huge quantities, especially using the afterburner to take off and get to full speed. The disaster at Charles de Gaul ws explained in detail. A front tire ran over a piece of metal which blew the tire, flinging shards of rubber into the lower wing breaking the fuel tank, which spewed gas out catching a spark from the engine. Both engines on the left blew up and the aircraft was past the point of no return for takeoff, but didn’t have enough power o the remaining two engines for adequate lift and so crashed killing all on board. Shortly thereafter, the fuel tank was reinforced with kevlar and the tires were re-designed by Michelin not to come apart with a blowout. But soon thereafter, 9/11 occurred and the public temporarily lost interest in flying, nearly wiping out the airline industry. It was the kiss of death for the very expensive Concorde, which was retired in April 2003. Sir Richard Branson offered to buy British Airways’ Concorde fleet for service with Virgin Atlantic Airways, but British Airways refused the offer. The real cost of buying the aircraft was £26 million each. The airframe design and engineering of the Concorde was magnificent for 60’s technology, including analog computers. Looking at this beautiful machine, I can’t help but wonder if the same basic design could be rebuilt using 2010 technology and materiel to become profitable.